ISIS is all but eradicated in Syria and their stranglehold in the Middle East is lost, but that hasn't stopped the few dissidents who remain in hiding throughout the world from striking from the shadows in cowardly attacks. The latest of these attacks took place in Cairo where Islamic militants killed eight Christians and wounded at least 12, according to the Interior Ministry. The attack took place when a bus carrying Christian pilgrims was on their way back from a remote desert monastery to the south of Cairo called Saint Samuel the Confessor Monastery. According to Coptic Orthodox Church spokesman Bouls Halim, the death toll is likely to increase. Church officials in the Minya province say the death toll is 10 but that number has not been verified. Coptic Christian Archbishop Makarious of Minya said, "Terrorists opened fire on a bus carrying people." Initially, no group claimed responsibility for the attack but it bears a resemblance to a recent attack by Islamic State militants. Six of the victims were all from the same family according to the Facebook page of the Coptic Orthodox Church in Egypt. Friday night, the Islamic State claimed responsibility for the cowardly attack through its Amaq news service. The group's Egypt affiliate has vowed to target the country's minority Coptic Christians. The attack is the first to be claimed by the militants this year outside northern Sinai where they are still engaged with Egyptian security forces. The Islamic State claimed in a statement that they killed 13 and wounded 18 in response to the jailing of females they claim to be their supporters. The attack bears resemblance to a similar attack carried out in May 2017 when gunmen attacked buses carrying Christians on their pilgrimage. That attack left 28 people dead and was the last major assault on Christians since December 2017. Local's fear the attack could be a sign that the group is launching another campaign against the areas Christians. President Abdel Fatah al-Sissi tried his best to quell the concerns of the community that has supported him despite the attacks by Islamic militants over the last couple of years. Egyptian officials working with analysts say the Islamic State's targeting of Christians could be part of an attempt to expand their theater of operations and create religious divides among the country's populace. 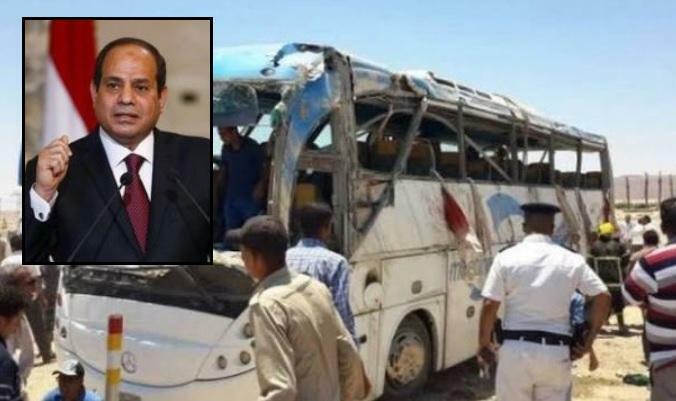 President Sissi said, "I mourn with deep sorrow the martyrs who were killed today by treacherous hands which aim to undermine the solid fabric of the nation, and I wish a speedy recovery for the injured. I confirm our determination to continue our efforts to combat dark terrorism and apprehend the culprits." Officials also said the death toll would have been higher Friday if not for the fact that one of the buses carrying the pilgrims escaped by swerving onto another road. Two other buses did not make the same decision and were stopped by the militants who were blocking their path with two SUVs. Bishop Aghathon Tala'at, who is near the hospital where victims were treated, said, "A number of masked men got out of them, took the mobile phones of the passengers and then shot all the men dead. They were wearing military-like uniforms, survivors told me. There has to be a security solution. The road is not paved well, there is not enough lighting, and there is no cell network, either. This is why it is targeted." hm.. shouldn't Trump have acknowledged this tragedy since they were fellow Christians? All time and history has shown these people do not assimilate & they only tolerate themselves, based on the interpretation of beliefs. With the most violent sects ruling them all. So why the constant repeat of failed attempts of reconciliation? Madness to repeat with death as the result. They believe there can be only one religion. They will infiltrate all societies until in control. Then life is at their mercy. Mayhaps the time has come for the final end of all religions that promote the death of others. Do to them before they do to us.